In a shallow bowl, soak the bread cubes in water to cover for a minute or two. Drain the bread cubes and squeeze with your fingers to press out the excess moisture (make sure you do this well). In a large bowl, combine the bread cubes, beef, eggs, garlic, pecorino, parsley, toasted pine nuts, salt and pepper, and mix with your hands to incorporate. 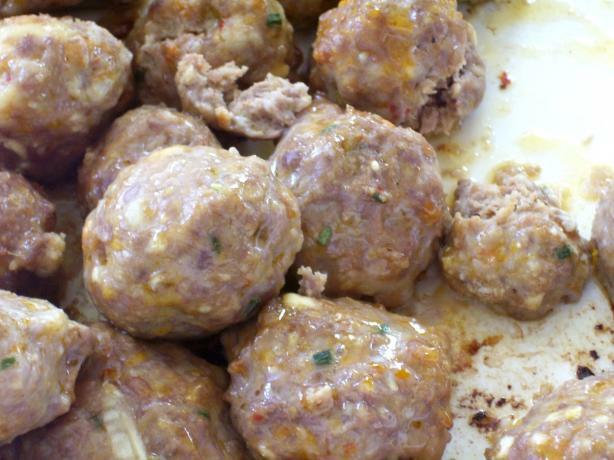 With wet hands, form the mixture into 12-15 meatballs, each smaller than a tennis ball, but larer than a golf ball. In a large, heavy-bottomed skillet, heat the oil over medium heat until almost smoking. Add the meatballs and, working in batches if necessary to avoid overcrowding the pan, cook until deep golden brown on all sides, about 10 minutes. Add the tomato sauce and reduce the heat to a simmer. Cook all the meatballs for 30 minutes. Set aside and allow to cool; save the sauce for another use. On a large heavy baking sheet, toss all of the vegetables with the oil, salt, pepper, and dried herbs to coat. Transfer half of the vegetable mixture to another heavy large baking sheet and arrange evenly over the baking sheets. Bake until the carrots are tender and the vegetables begin to brown, stirring after the first 10 minutes, about 20 minutes total. Toss the pasta with the vegetable mixtures in a large bowl to combine. Toss with the cherry tomatoesand enough reserved cooking liquid to moisten. Season the pasta with salt and pepper, to taste. Sprinkle with the Parmesan and serve immediately. The optional lemon juice is used to help make the dough easier to handle.Shortening: All butter may be used, or a combination of butter, vegetable shortening and lard for the flakiest crust. In the bowl of an electric mixer, combine salt, 2 tablespoons sugar, and 4 1/2 cups flour. Using the dough hook attachment, work 3 tablespoons butter, 3 tablespoons of lard, and 2 tablespoons butter flavored Crisco into dough, as though you were making a pie crust.In a small bowl, dissolve 1 tablespoon honey in 1/2 cup lukewarm water, stirring well until dissolved. Bring water temperature to about 105°F (or warm to the touch). Stir in 1/3 cup flour to “feed” yeast. The yeast mixture should begin to bubble and foam up. Set aside for 10-15 minutes. Tip: It’s a good idea to keep more than one type or brand of yeast on hand if you bake your own bread often. When you measure out your yeast, you can use half from one jar, and half from the other brand of yeast at the same time. This is good insurance in case the yeast isn’t as active as you’d like it to be; if only half the yeast is good, your bread will still rise; it will just take longer. In a small heavy bottomed saucepan, scald 1/2 cup milk. Watch milk carefully during the scalding process and remove from heat when the milk begins to foam slightly. Set aside and allow to sit undisturbed. A skin will form around edges and on top of milk as it cools. Remove the coagulated milk from the edges and skim the top skin off using a spoon. Pour the cooled (85°F) milk into the yeast mixture.Using the same saucepan the milk was heated in, melt 4 tablespoons butter. When butter has nearly melted, add 1 1/2 tablespoons olive oil and remove from heat. Allow to cool to nearly 85°F.Break 5 eggs into flour mixture. Mix on medium setting 2 minutes. Add butter mixture and 3 tablespoons buttermilk or sour cream. Pour yeast mixture into flour mixture and combine. Add 1/2 teaspoon fresh lemon juice (do not substitute).Knead at medium speed of electric mixer for 8-10 minutes. If dough is too stiff for easy mixing, add a few tablespoons water. Turn out onto lightly floured board and using your hands, which you’ve rubbed with olive oil (remove jewelry! ), knead gently for 5 minutes. Dough should be light and airy, and somewhat sticky. As you knead, you should hear little “pops” as air bubbles break and new air pockets are formed. At your deli, have the cold cuts sliced thinly, with the prosciutto being shaved thinly enough to see through it.Remove the casing strings from the cold cuts, roll them up and slice them into 1/2 inch wide strips.For the pepperoni, sopressato, or salami, chop the strips into small squares. Chop half of the mortadella into squares as well, reserving half of it to layer in criss-cross strips to create a layer in the same way that you’ll be using the prosciutto.Measure out a half cup of the ricotta. Add Parmesan and Romano cheese to this, then stir in the cracked whole peppercorns. To crack peppercorns, measure out quantity of whole peppercorns into a plastic bag and then use a rolling pin to crush them as you would bread crumbs. Add the filling to the crust, beginning by lining the bottom of the crust with a thin layer of proscuitto, torn into strips. Cover with a scant layer of very thinly sliced boiled eggs (the boiled egg here is optional – feel free to leave it out). Insert 3 tin-foil funnels or pie birds through pie crust top in order to allow steam to escape. Let rise 15 minutes, brush crust with egg glaze before baking in a preheated 350°F oven for 45 minutes. Calzones: If you have any leftover dough, roll it into small circles, fill with any remaining cold cuts or filling mixture that you have, toss on some shredded provolone or mozzarella cheese; fold into half circle, turnover-like shapes. Fold in and crimp edges, pressing to seal. Brush with glaze after allowing a 15 minute rise. Bake calzones at 375°F for 20 minutes, or until golden. Known in our family as “Pizzagaina”, (Pizza jay-nah) this multi-layered dish is quite an undertaking to prepare, but the effort spent will be well worth your time. And you’ll be able to prepare it a day or two in advance, leaving you free to relax and enjoy the holidays with your guests. This recipe has been a treasured favorite in our family for many generations, and now, it can be a tradition in your family, too. To make the shells, mix together the flour, butter or shortening, sugar, and salt. Begin to add the wine, adding enough so that you have formed a fairly firm dough. Knead for a few minutes until smooth, then form into a ball, wrap in plastic wrap, and let sit at room temperature for one hour. Cut the dough in half, and roll thinly to about a 1/4 inch thickness. Cut into 4 square, and place a metal diagonally across each square, and wrap the dough around the tube. Seal the edges with a little beaten egg white. Heat the oil in a large pan until it reaches a temperature of 375 degrees F.
Drop one or two tubes into the hot oil at one time, and cook until golden. Remove from the pan, cool, and gently slide the cannoli shell from the tube. Continue to make the rest of the shells in this manner. To make the filling, first let the ricotta sit in a strainer over a small bowl in the refrigerator for 30 minutes to remove excess water. Mix the ricotta with the rest of the ingredients. Fill each cannoli shell carefully, and sprinkle with a little extra powdered sugar if desired. Decorate ends of cannoli if desired with mini chocolate chips or chopped pistachios. 1. Pour olive oil into a 12-inch frying pan (with sides at least 2 in. 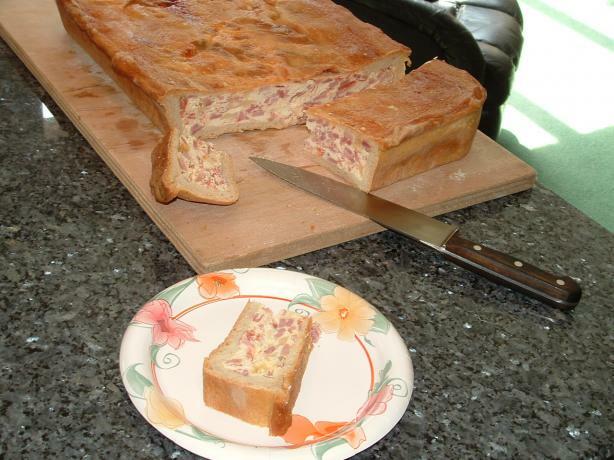 tall) or 6- to 8-quart pan over medium heat. When warm, add crabs in the shell and cook, stirring occasionally, until juices leak into pan, 5 to 7 minutes. With tongs, transfer crab pieces to a large serving bowl; cover and keep warm in a 200° oven. 2. Add tomatoes (including juice), garlic, and basil to pan. With a wooden spoon, scrape any crab bits from bottom of pan. Cover and bring to a boil over high heat, stirring occasionally. Boil gently, uncovered, stirring occasionally and crushing tomatoes with a potato masher or spoon and reducing heat as sauce thickens, until sauce is thick and reduced to about 4 1/2 cups, about 30 minutes. Remove from heat. Spoon about a third of the sauce over crabs in the shell; cover loosely and return to oven. 3. About 15 minutes before sauce is done, in a 6- to 8-quart pan over high heat, bring 3 to 4 quarts water to a boil. Add pasta, stir to separate, and cook just until barely tender to bite, 3 to 4 minutes for dried angel hair pasta, about 2 minutes for fresh linguine. Drain. 4. Over low heat, add the shelled cooked crab to remaining tomato sauce; stir occasionally until hot, 1 to 2 minutes. Add salt and pepper to taste. Pour drained pasta into sauce and mix well. 5. Mound pasta in a wide, shallow serving bowl. Remove crab from oven and sprinkle both crab and pasta with parsley. 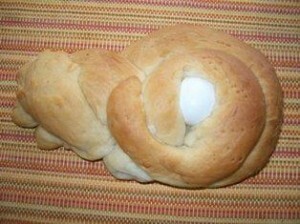 This is a specialty sweet bread that Mamma makes only at Easter time. This sweet bread has a heavier consistency than your typical bread and the finished product has a yellow color tinge to it. The Kids will gobble it up and it will soon become an annual Easter tradition. Beat the 7 eggs well with whisk. Add 3 cups sugar, add 2 cups of vegetable oil, 8 ml salt or little more than 1/2 tbsp salt, 1 cup milk. Whisk well to add more air. Add flour to make a dough consistency (approx 5 cups) and add 7 teaspoon baking powder. Roll and twist the dough in strips, add decorative egg (raw, shell still intact of course), shape as per above image. Use thinner strip of dough to wrap the egg on the top or for the last layer. Bake at 300 deg F for about 35 minutes. This sweet bread is a treat Mamma gives to all the grand-children each year and it is also known as pane di pasqua in Italian. Combine first four ingredients in a blender; process until smooth. Melt butter in a saucepan over medium-high heat. Add garlic; sauté 30 seconds. Add milk mixture to pan; cook 3 minutes or until mixture simmers, stirring constantly. Cook 2 minutes or until thickened, stirring constantly. Remove from heat; stir in cheese. Cover. Place asparagus on jelly-roll pan coated with cooking spray. Bake at 425° 10 minutes or until browned, stirring once. Cook both pastas according to package directions, omitting salt and fat; drain well. 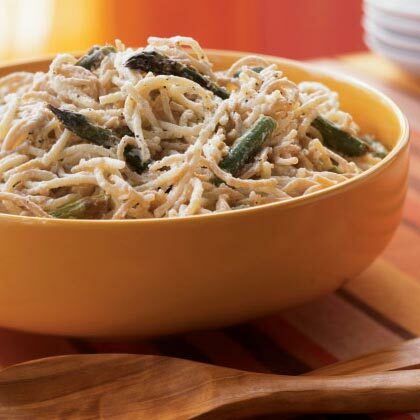 Place pastas and asparagus in a large bowl. Add cheese mixture, tossing well. Add truffle oil and pepper; toss gently. Serve immediately. Note 1: I prefer to cut the garlic cloves in slices; the more slices you have the more the garlic flavour will be released in the oil. Also, cutting the garlic in slices will help, when you dish the spaghetti, to give each guest his/her share of garlic. At the same time, slices can be easily removed after having flavoured the oil (some people like the garlic flavour but don’t want to physically eat it). Don’t chop the garlic because the tiny pieces can easily burn and become bitter; this would spoil the sauce. Note 2: in Italy, dried chilli in the kitchen is a “must have” ingredient. We usually buy little dried red chilli pepper from south Italy, referred to by the name of “diavolicchi” (little devils). They are very hot and one of those small chilli peppers, can really put your mouth on fire! These are ideal for the preparation of sauces requiring hot chilli and once dried can be stored in a cool and dry place for more than a year. Alternatively, you can prepare the aglio olio peperoncino sauce using fresh red chilli. If the fresh chilli is very hot, you may need just one chilli pepper (use two chilli peppers if they are medium hot). Directions: To start, roughly chop the parsley, slice the garlic cloves and cut the chilli peppers into rounds (discarding the seeds). Fill a large pan with approximately 4 litres of water. Bring the water to the boil, add salt (10 g for each litre of water) and add the spaghetti. For this recipe, cook the spaghetti until they are almost “al dente” (firm to the bite). When the spaghetti have been cooking for 5 minutes, start making the aglio olio peperoncino sauce. To make the sauce, heat the extra virgin olive oil in a large saucepan. The heat should be gentle, to allow the oil to be infused without burning the garlic and chilli (burned garlic would spoil the sauce). Add the garlic and chilli to the pan. Gently infuse the oil for a couple of minutes or so, until the garlic become golden in colour. Tilting the pan will allow you to better infuse the oil and it is less likely that the garlic become burned. If your timing is correct, your spaghetti should, by now, be almost cooked al dente. Add half of the parsley into the hot sauce. Give the sauce a quick stir and quickly drain the spaghetti, retaining half a ladle of the boiling water you have used to cook the spaghetti. Add the drained spaghetti to the large saucepan containing the hot sauce. Add half a ladle of the water you have used to boil the spaghetti. This water will help to create an emulsion, which will coat the spaghetti. Toss the spaghetti, over fierce heat, for a minute or so. Now, if you like (but it is not strictly necessary), add the remaining parsley and toss the spaghetti again for few seconds. The spaghetti aglio olio peperoncino is ready to be served. Plate the spaghetti and enjoy this hot dish with a glass of chilled dry white wine from the Castelli romani wine producing area. Many people in Italy, and in Rome too, like to eat this spaghetti dish topped with some freshly grated Pecorino Romano cheese. Purists say it is an offence; personally I think adding a bit of Pecorino cheese is fine, as long as you don’t exaggerate, otherwise the cheese flavour will overpower the typical flavour of the aglio olio peperoncino sauce. Buon appetito!